Idaho, Spring Time: After a tossing and turning night of sleep, I awoke from a dream. The vegetable fairy had decided to plant some russet Idaho potatoes from the fall harvest in a beautiful plentiful garden. It had rained the night before, so the soil was damp and soft. A group of potatoes poked out of a mound waiting for the gardener to come back and retrieve them since she had taken the time to dig them up early that morning. The gardener’s name was Eugene, she had no room left in her basket of produce that morning when she placed it down in the dirt to dig her potatoes. What she didn’t notice was a few stalks of asparagus that had fallen out and rolled away. When she was done digging she picked up her basket and went inside her house to empty the basket. In that moment one of the stalks of asparagus made quick friends with the potato laying closest to it. They talked about the great possibility of being made into one of Eugene’s famous tarts for dinner that night, and how grand it would be if they ended up on the same one. As fate would have it…. they did. Disclosure: I am proud to say this video is sponsored by The Idaho Potato Commission. The story and recipe is 100% my own. Thank you Don for being the absolute best! 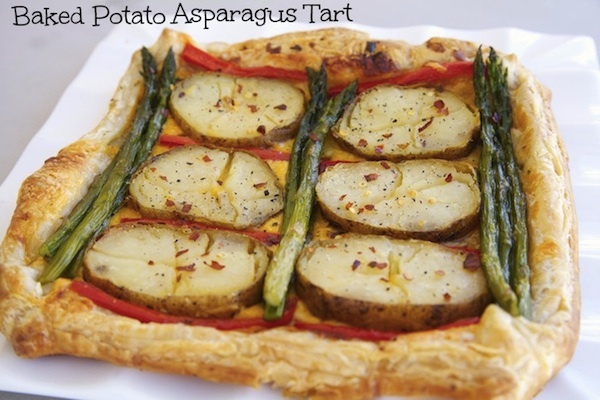 What a creative recipe and use of potatoes!